Avnel Gold Update: There's Even More Value Than We Thought! Recall that for Seeking Alpha's "best idea for 2016" contest we entered our thesis on Avnel Gold (TSX: AVK) (OTCPK:AVNZF). Due to exclusivity rules we can't reprint it at miningWEALTH, although it is a name that we've covered here and that we've covered on Seeking Alpha for nearly two years now. We wanted to update our analysis of Avnel Gold based on two developments. The first is a rising gold price. Gold currently trades at ~$1,250/oz., yet when we published the article in late December gold traded below $1,100/oz. We used $1,075 in our assessment of the company's economics. Second, we assumed a gold recovery rate of 93%. The company just put out a press release in which it shows that it will achieve higher recoveries, as outlined on the following table. We've updated our numbers to reflect these changes. We've assumed a $1,250/oz. gold price, 94.5% recoveries for the first three years of production (when the company will be producing the most saprolite/saprock), and 93.2% for the remaining years. 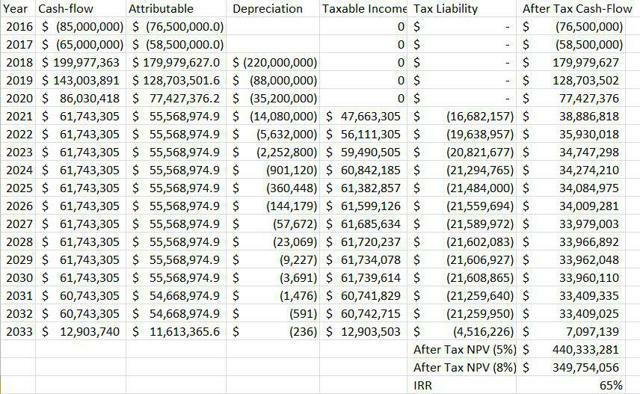 The following two tables show our updated valuation estimates for Kalana based on these changes. You are encouraged to read the original piece, which provides the other assumptions we're using to value Kalana and Avnel Gold's share of the asset. These numbers are nothing short of phenomenal, with the nearly $200/oz. move in the gold price pushing the project's post-tax IRR from 48% to 65%. 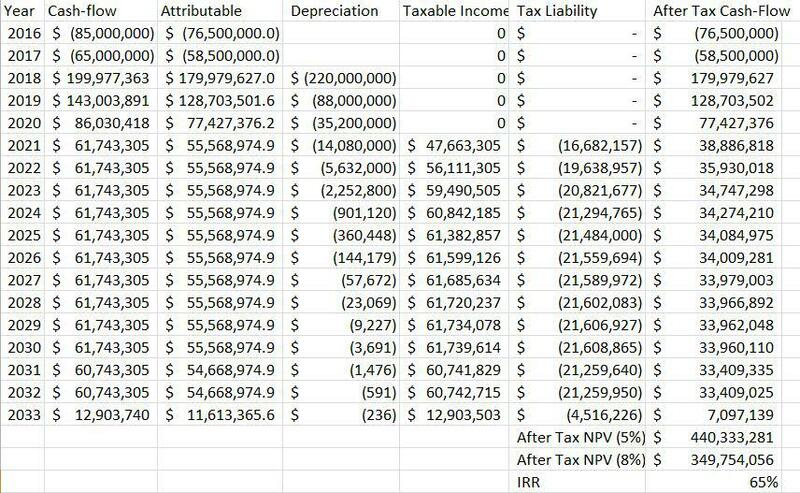 Meanwhile the NPV (8%) has skyrocketed from $222 million up to $350 million. The company's valuation is roughly the same-it has been trading between C$0.20/share and C$0.25/share over the past several weeks in spite of the rise in the gold price. We don't know why the shares are under-performing, but there is little doubt that we've seen a meaningful fundamental improvement that will ultimately result in a re-valuation of the shares. Based on the increase in our post-tax NPV (8%) valuation assessment the project is worth 58% more now than when we assessed it in late December. Thus, regardless of the stock's under-performance relative to the rest of the gold space, we continue to see tremendous value in the shares, and we continue to believe that-at the current price-Avnel offers an extremely compelling risk/reward profile: quite possibly the best in the junior gold sector.